Buy Online Now! 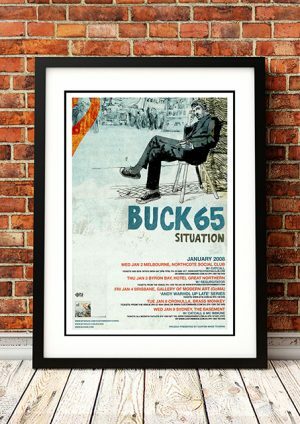 – Classic Buck 65 Concert Posters and Memorabilia. Richard Terfry (born March 4, 1972), better known by his stage name Buck 65, is a Canadian alternative hip hop artist. Underpinned by an extensive background in abstract hip hop, his more recent music has extensively incorporated blues, country, rock, folk and avant-garde influences. Terfry was initially interested in pursuing a career in professional baseball, and at age 16, was scouted by the New York Yankees; however, his dream was ended following a shoulder injury. He was first exposed to rap music in the mid-1980s while listening to CBC Stereo’s late-night show Brave New Waves, and then by listening to Halifax campus community radio station CKDU. We stock an awesome Buck 65 Print.